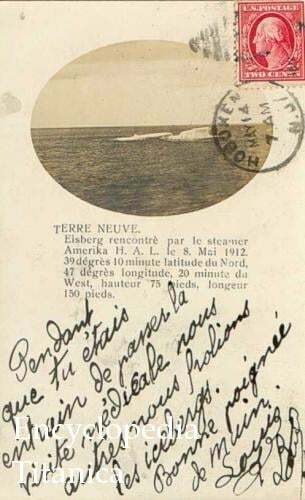 Eisberg rencontrè par le steamer Amerika H. A. L. le 8 Mai 1912, 39 dégrès 10 minute latitude du Nord, 47 dégrès longitude, 20 minutes du West, hauteur 75 pieds, longueur 150 pieds. Iceberg crossed by H. A. L. steamer Amerika on 8 May 1912, 39°10' N, 47°20' W, 75 ft high, 150 ft long. The postcard is published from a picture taken on board the SS Amerika, and this one was sent home by one Louis-René and Marie-Louise, French passengers on board the Amerika, on 14 May 1912, to their Uncle G. Larroche. The postcard was sent from Hoboken, N. J. It shows a large iceberg ('Eisberg' in German) that could have been the one that sank the Titanic one month earlier.